Busy times around the house this week. It's that time again when we start ramping up toward CHA. On one hand I hate to think it's only 5+ weeks weeks away (so much to be done). On the other hand, I love CHA; there's nothing like transforming the booth into something magical, talking to the retailers, and seeing old friends. It's hard work and a lot of hours but I seriously love it all. I found the fabric flower idea on Pinterest a while back and wanted to try it with Tim's fabric. 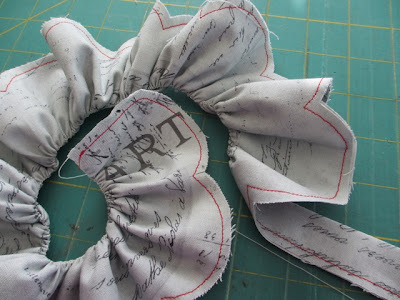 The original tutorial was created back in 2010 by Anj, you can see it here. 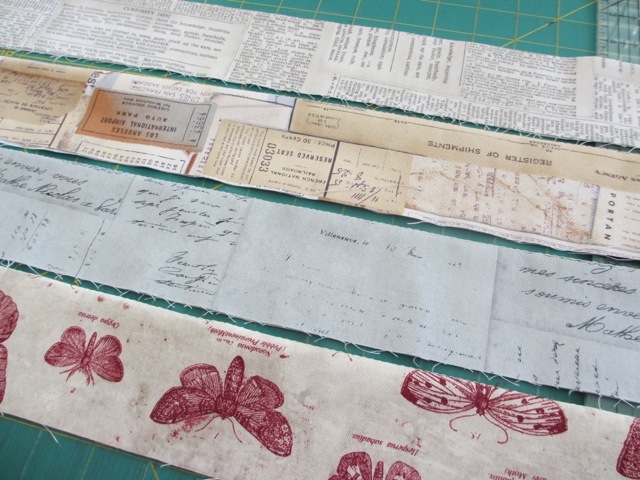 I started with a few strips of Eclectic Elements fabric, cut 5 x 44". 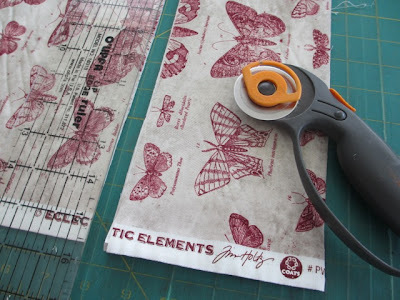 Fold the 5" strip in half and iron so that you have a strip that is 2 1/2 x 44". Move to the sewing machine and run a basting/gathering stitch right along the fold (you will gather this later). 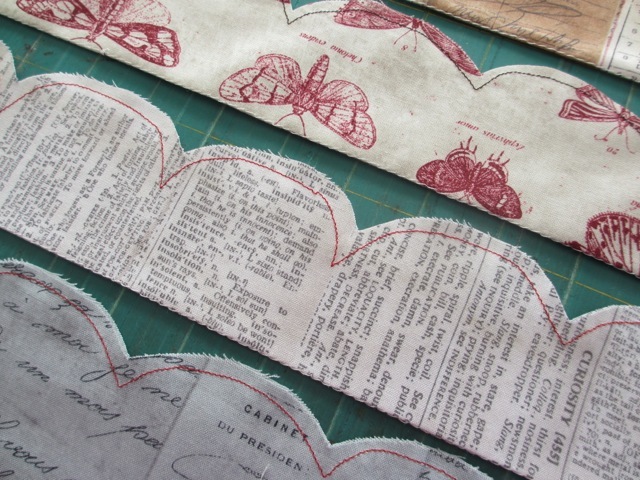 Since I am making a lot of flowers I created an assembly line by cutting all the fabric, then ironing, then sewing. It makes for a whole lot less thinking rather than completing one flower start to finish, then starting over. 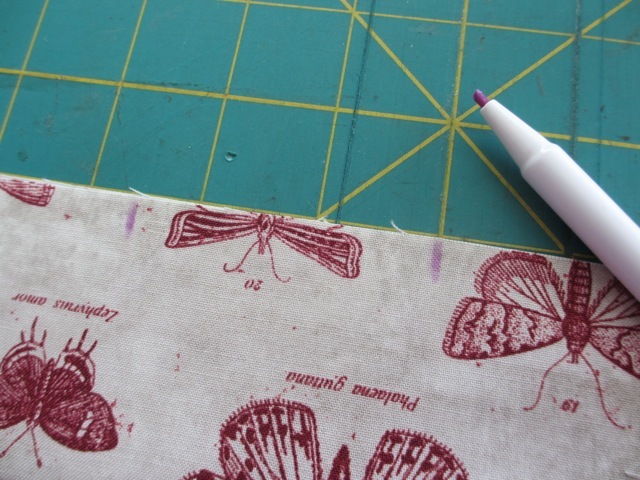 Once the strips are stitched, I marked the raw edge of the strip every 2 1/2". I used a fabric marking pen but you can use whatever you like as this part will be cut away. Pick up the strip and hand cut scallops between the marks. The cutting does not have to be perfect. I promise, when finished you will never be able to tell which scallops were wonky and which were perfect. 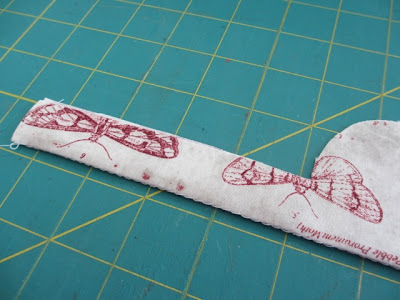 On one end of the strip you will need to leave a 4-5" tail, just like this. 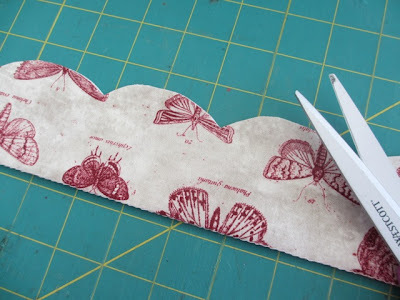 Once one strip is cut you can either mark the next one or just lay the first strip on top of the next and use it as a pattern. Cut all the scallops on all the strips. Remember, they do not have to be perfect scallops. Next is to go to the machine and stitch the scallops closed. 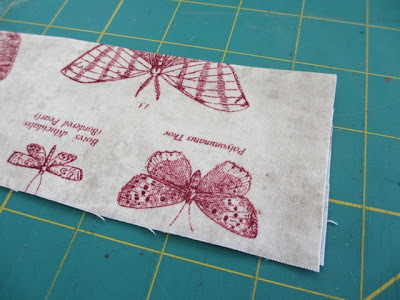 I stitched some in black, creme and red depending on the fabric color. 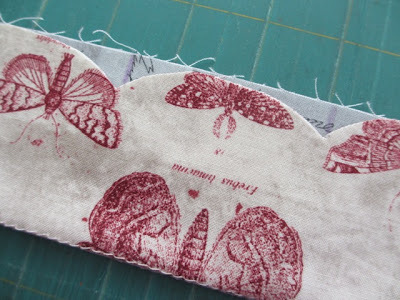 Once stitched, gently pull one string on the gathering stitch to gather the strip. Cut a stick or dowel to use as a stem. 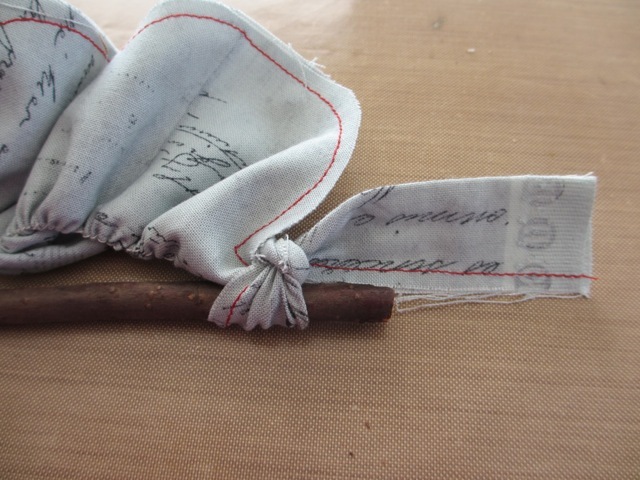 Tie the "tail" to the stick with the skinny strip heading towards the end of the stick. 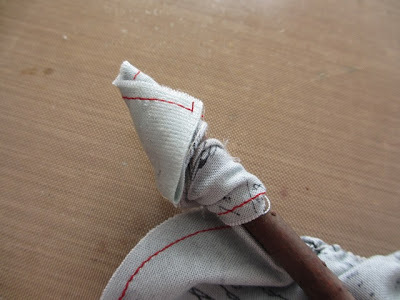 Wrap the "tail" around the end of the stick to create a sharp point and glue into place. 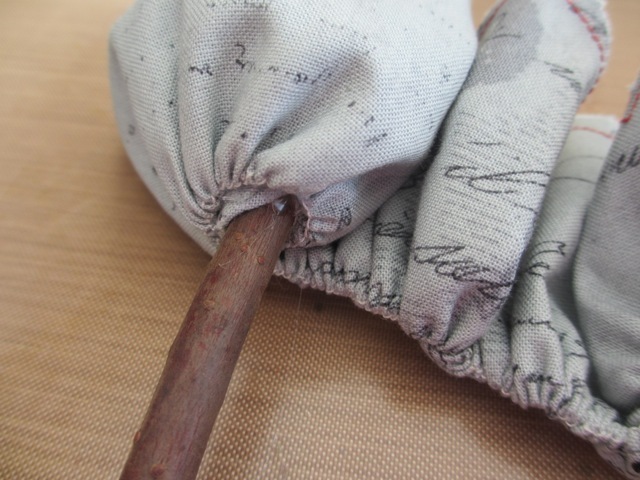 I used a low temp glue gun to secure the fabric to the stick. 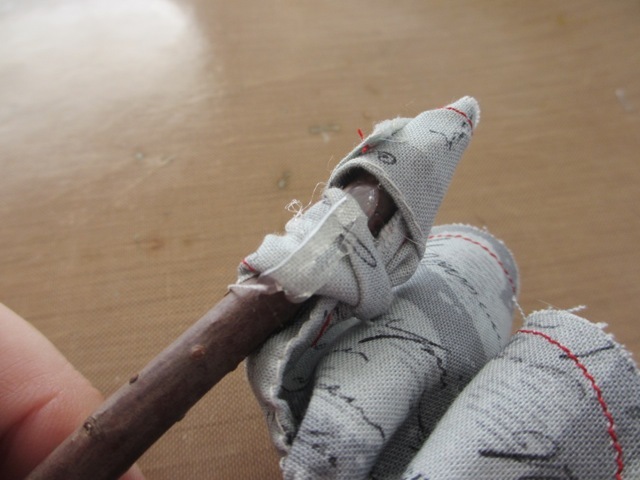 Add a bit more glue and begin wrapping the gathered fabric around the stick. Once you go around the stick once, position glue so that it is at lest 1/2" below the gathering stitch. This will make your flower much more open. Keep gluing, little by little, until you run out of fabric. To cover the unsightly bottom of the flower, I cut wool flowers using Tattered Floral die. I just cut a hole in the center for the stick then slid it into place. 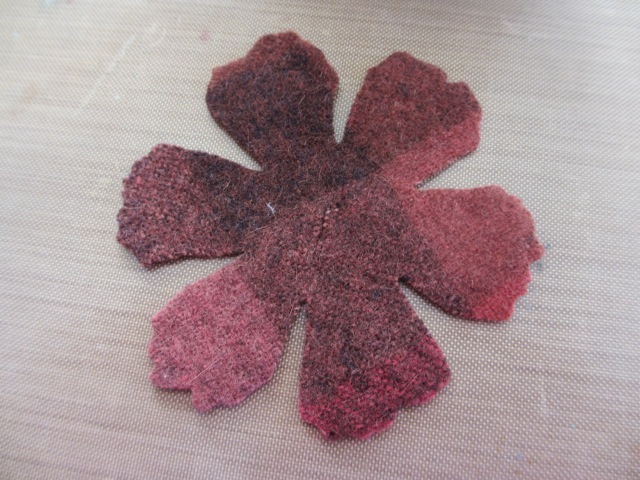 Once the wool piece was close to the flower, I added a bit of glue, and adhered it to the bottom. 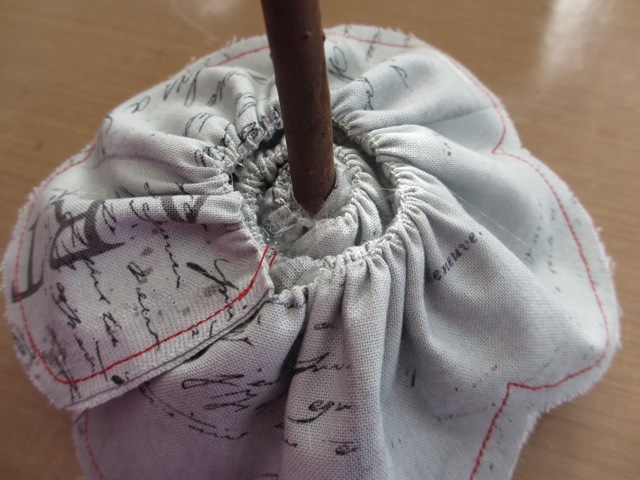 It worked perfectly to not only cover the bottom, but it looks like it's part of the flower. 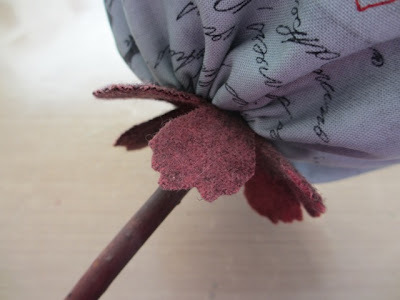 Of course you could cut these in green to make them more "natural"; but I figured what the heck, my fabric is untraditional, why do the petal have to be? I ended up making 5 flowers for my vase. This is a really easy project and they came out great. Again, thanks to Anj for a great tutorial to begin with. Paula - love love love this! They are so terrific. 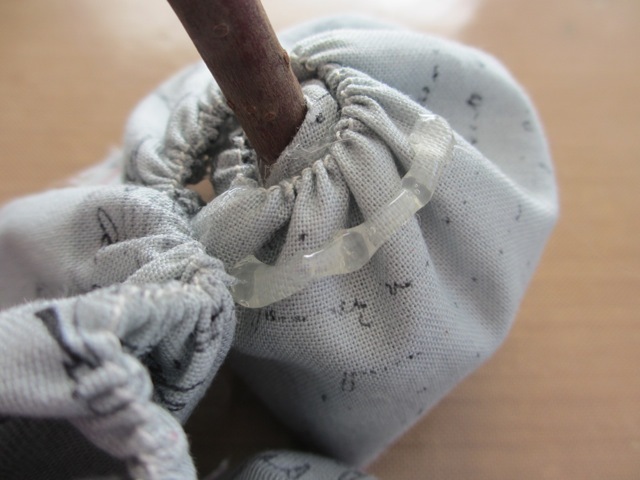 I look forward to each new post on your blog, because I'm always inspired and amazed! Thank you! thanks Renee, that is so nice of you! Wow, they are gorgeous. love the flowers. These are amazing!!! I can't wait to make some. Thanks for the tutorial! WOW these are fabulous!!! I will have to try this, thanks for the inspiration!! These flowers are fabulous!!! Love them! Thanks for the inspiration! You always amaze me!! 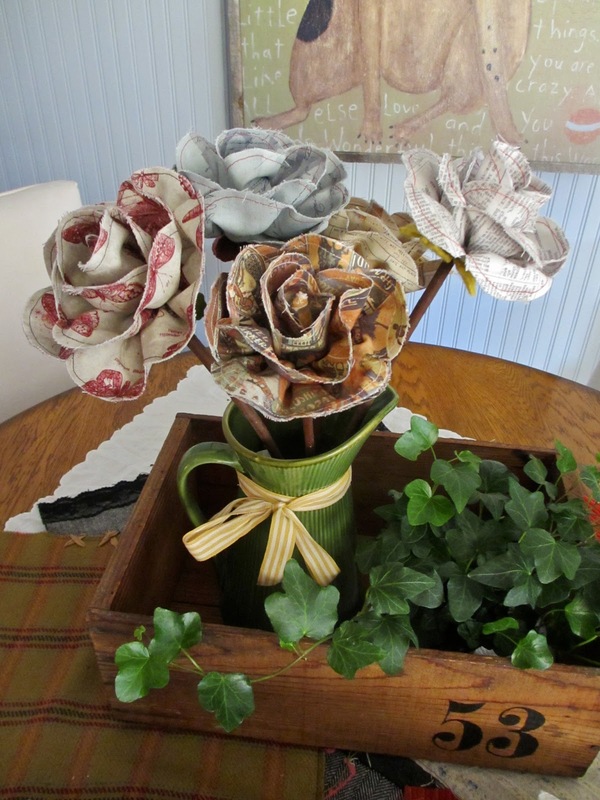 Flowers look super in the number stamped wood box......of course the fabrics are fabulous. Tim's stuff and Paula - what a pair! I adore this madly! Love, love, love! that was very painstaking of you to cut all those scallops Paula but what a fabulous result. must try those! 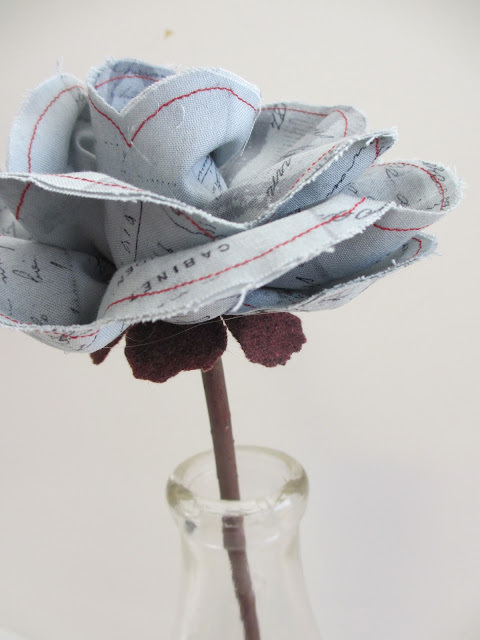 These are amazing flowers and the wool tattered floral piece such an awesome touch... gosh you make it look so easy ! Enjoy your CHA prep !! thanks Rea! will try to enjoy while being crazy busy! Just how i like it! These are AMAZING!!! What a brilliant design as well! You are too smart! Love the red thread!!! Love these flowers Paula - thanks so much for the wonderfully detailed directions! Have fun at CHA! I am always looking forward to your next creative post! Adorable flowers Paula. Thanks for the tutorial! 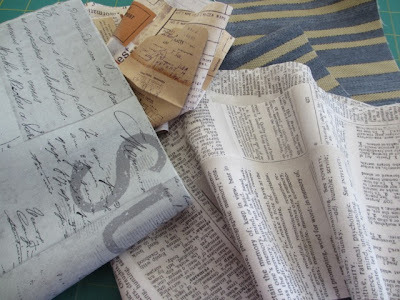 MUST GET TIM'S FABRIC -- resistance is futile! Your flowers are just gorgeous. Love the flowers! Thanks for doing a tutorial on how to make them for us! Stunning ! It looks like you folded the flower strips in half prior to sewing the scallops but it doesn't say to. Is that correct? Thanks for the fabulous inspiration ! 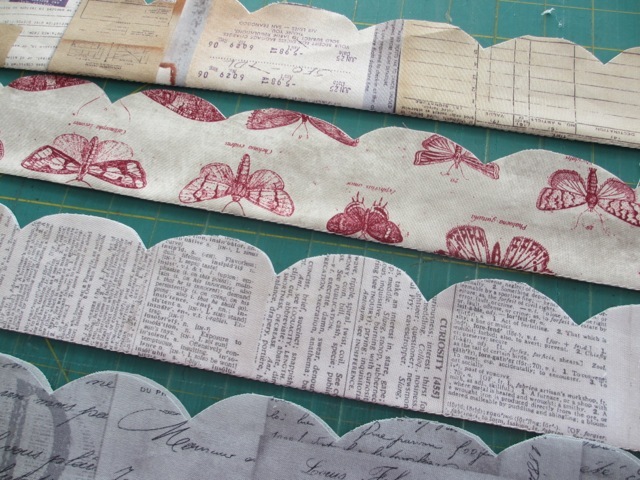 Dawn, the strips are folded in half before sewing the scallops. Love these flowers! I am going to have to try them. You do the most amazing things Paula. Thanks for the sneak peak. thanks Shawn...glad you came by to share in the fun. 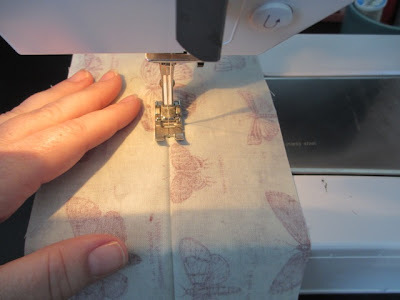 I was so excited to see Tim coming with fabric, so that my Mom, who is a quilter, would love his designs as much as I do. NEVER did i think I would find so many uses for them and I'm just loving all the ideas I've been seeing on various blogs. Thank you for the beautiful flowers and even more ideas. 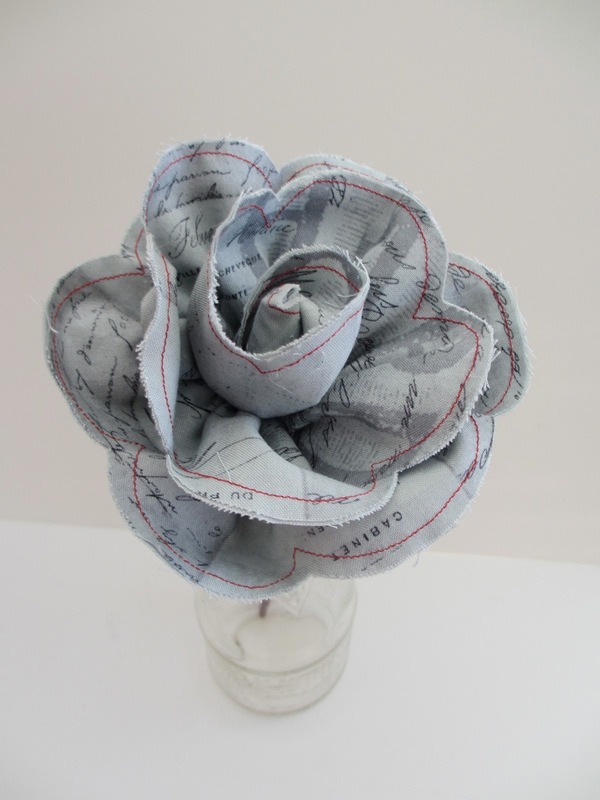 I have been going through your blog and I am amazed at your talent, your creativity and your informative tutorials. Your site is fantastic and I am hooked. Please visit my humble blog, my welcome mat is always out.